On Saturday April 6th Aspen Olson, Newton High School Senior received recognition as the first ever recipient of the Newton Area Women of the Year Scholarship during the Annual WOY Brunch. In 1956, a program was started to honor Newton-area women who gave freely of their time and talents and have made our community a better place to live. 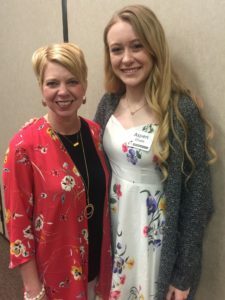 Clubs, organizations and individuals were asked to nominate women from the community involved in Community and Civic Service, Education, Religion and Business and Professional Areas, who they felt had contributed to the community. After more than 60 years this program has now expanded to include a scholarship for young women who already demonstrate these values. In addition to being a scholar Olson is involved a variety of activities and clubs. These include: Chemistry Club president, Yoga Club, Friendship bracelet club vice president, Do Crew officer, high school varsity soccer, club soccer, Olympic development program soccer, New Creation fellowship church youth group, Mennonite Central Committee, Sources of Strength peer leader, and the high school swim team. Olson plans to follow the pre-med track with a Major in Biology at the University of Kansas. This ambitious young woman intends to then follow a path for medical school after her undergraduate studies are completed. Pictured here is Aspen Olsen and Kristie Diller, CKCF Program Officer ~ Scholarships. Congratulations again Aspen on this very special recognition. ← Find CKCF on Social Media!